We rely on our 5 senses — sight, hearing, smell, taste and touch — to make observations. Through association, we make sense of this information in the brain to provide accurate impressions of the world. But are they really accurate? Take optical illusions for example. 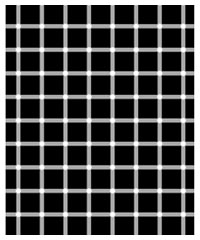 The image above shows a grid of white lines against a black background with white dots at their points of intersection. Except, the dots are sometimes seen and perceived as black. Do the black dots exist? No. But do we see them? Yes. An illusion is a distortion of the senses; A failure to make an accurate perception. Or what about synesthesia, the condition where people can see colours when they hear noises, or hear sounds when they see moving dots? If these colours or images are only seen inside the mind of one person, does it mean it exists? Or does it not exist because there are no other observers to these images? But first, what does it mean to “Exist”? According to the cambridge dictionary, to exist means to be, or to be real. What is considered “real” then? Our senses are evidently not entirely reliable as illustrated in the above two examples. To add fuel to fire, the way our mind processes these sensorial information aren’t entirely accurate either. Firstly, the brain only processes information that it thinks will be useful at a later date. So not all information is taken in; only a semblance of a full picture. Secondly, the way we perceive or interpret as fact may often be clouded by preconceived notions, past experiences, and prejudices. Thirdly, imagination and association comes into play in the story telling mind. We often try to fill in the blanks in order to make sense of our reality. In the film “Room”, a boy (Jack) lived in a shed where he and his mother were held captive. They shared a bed, toilet, bathtub, television and kitchen. The only window was a skylight. He was born in the room and believed that only the Room and its contents were real. The rest of the world existed only on television. After 7 years of growing up in the room, they finally got a chance to escape and Jack stepped into the outside world for the first time. He struggled to adjust to life in the larger world, and expressed a desire to return to the room. The room was his only reality. Is this where we are currently in relation to our knowledge of higher consciousness or the existence of a supreme being? Are we also stuck in the room, thinking this is our reality when actually “reality” is something much bigger? Schrödinger’s cat is a thought experiment involving a cat in a box and a radioactive source. If there is radioactivity, the flask holding the poison will be shattered, and hence kill the cat. Before opening the box, there is no way of finding out if the cat is dead or alive. It is thus proposed that the cat is simultaneously both dead and alive. Applying that logic to the existence of a supreme being — we are in the state of uncertainty and are unable to open the box to prove if it exists or not. Till we are able to open the box, we can only speculate. We have no physical evidence to prove the existence of a supreme being. Even if there is evidence through the lens of someone else (like the TV in Jack’s room), are we able to take that as our reality? How do you prove if the outside world is true? If one day we are lucky enough to “encounter” or “experience” this supreme being, are our senses and mind ready to perceive what really is? But then again, after all these questions being asked, does it matter whether we know for sure or not?